During the Dutch Presidency of the Council of the European Union, Europe’s capacity to act as an innovator and job creator has been identified as one of the main challenges. Under the leadership of the Dutch government, various high-profile meetings, workshops and seminars tried to address this point. Behind the vision of a prosperous, competitive and innovative Europe lie several questions: how can we stimulate innovative entrepreneurship and strengthen new services? What would be their societal impact? What kind of jobs and growth would they create? The exhibition “Holland@CERN” tried to address some of these questions by discussing the challenges and opportunities of big science at CERN, one of most reputable facilities in the world promoting international scientific collaboration and excellence. 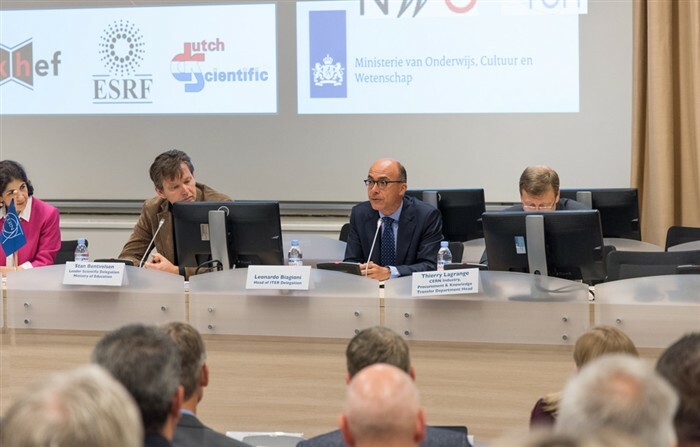 The event, organised by the FOM Institute Nikhef, TU RID Delft, FOM Institute DIFFER, NWO and the ILO-net, managed to bring together more than 100 attendees from at least 38 Dutch high-tech companies and representatives of major scientific collaborations. Participants were there to network, showcase their expertise, focus on knowledge transfer and explore new business opportunities. Leonardo Biagioni, F4E’s Head of Unit for Contracts and Procurement, presented the ITER project and elaborated on the intricacies of international big science procurement. One of the popular myths suggesting that big science is only for big players was quickly debunked given the contribution of smaller companies to ITER. Contrary to what one would have expected, their adaptability has given them edge and helped them to be competitive. Furthermore, due to the complexity and the variety of skills required to respond to the technical needs of the projects, international partnerships and the creation of consortia have become more mainstream. As a result, larger and smaller companies have been working together and learning from one another. ITER and other big science projects led by CERN, ESA, ESO or ESFR, have been strong advocates of innovation through a new business model that would create communities of know-how. Apart from the considerable injection of cash that comes with big science projects, in order to spin the wheel of progress forward, they offer potential. Their main legacy is the supply chain of services and know-how that we can capitalise on after having gone through the learning curve. This said, the gap between the end of a big project and the commercialisation of its technology breakthroughs has been listed as a key concern. On the other hand, the critical mass of skills and expertise gathered in big science projects is seen as the way forward educating suppliers for the future and giving them the possibility to work in a community which is continuously evolving.